My hubby and I have been blissfully (well mostly!) married for 23 years. It’s also my 23rd anniversary with my bedroom furniture and while I won’t be trading in my husband, it’s definitely time to trade in my tired old furniture. 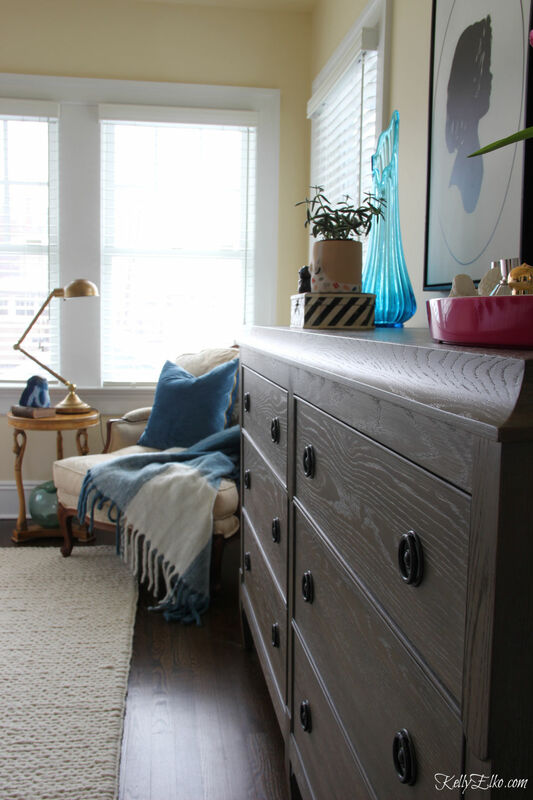 I am excited to share my master bedroom makeover! My poor bedroom has been neglected for far too long and she deserved a swan makeover! Over the years, I’ve made a few changes but the room still lacked pizazz. 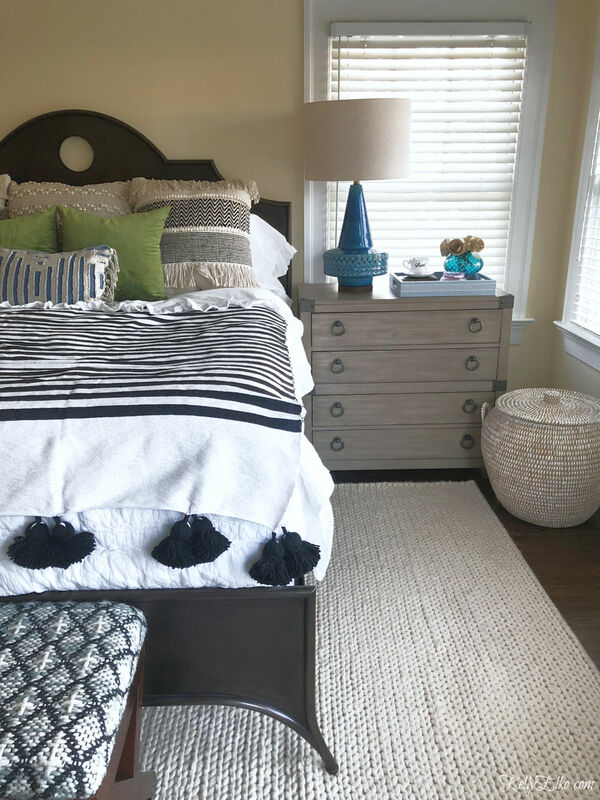 I’ve searched high and low for the perfect furniture and was thrilled to partner with Raymour and Flanigan to make my bedroom dreams come true. 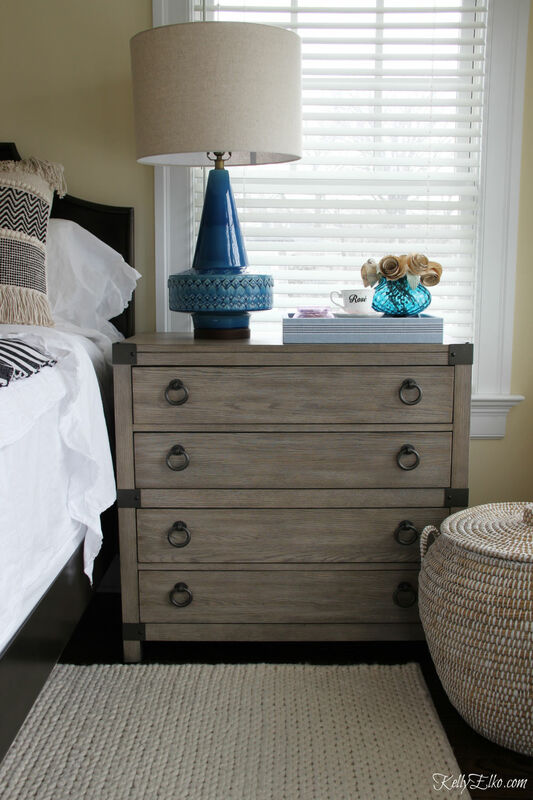 Goodbye tiny nightstands with missing handles and worn finish. 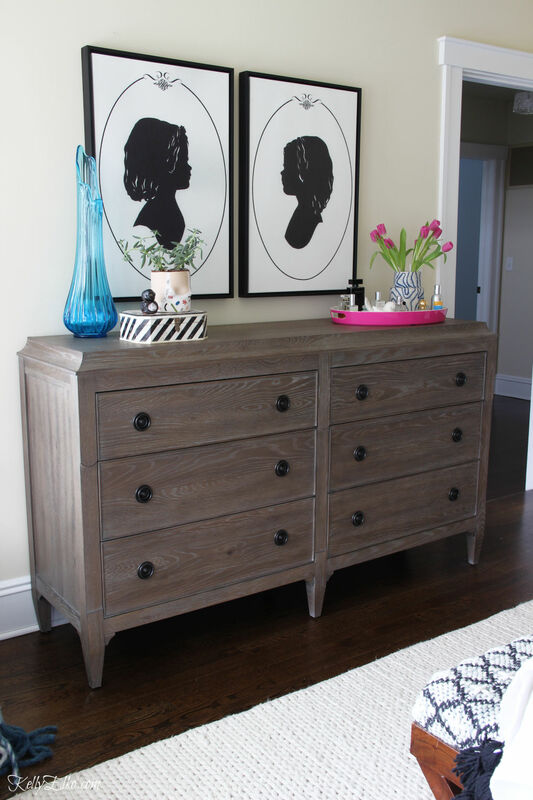 Hello pair of Myra Accent Chests that I’m using as nightstands with tons of storage! I love symmetry and I’ve always hated that there is a window on only one side of the bed so I added a huge piece of art to visually balance the space. 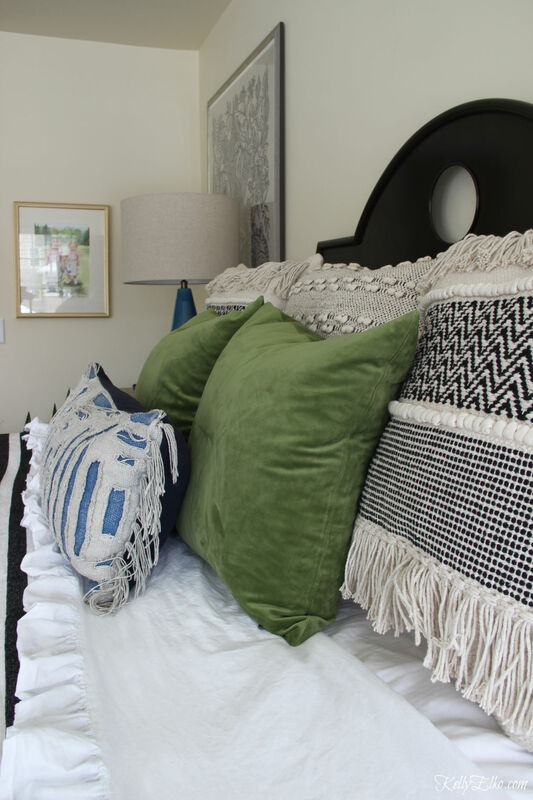 Black and white bedding is a perfect backdrop for colorful throw pillows. 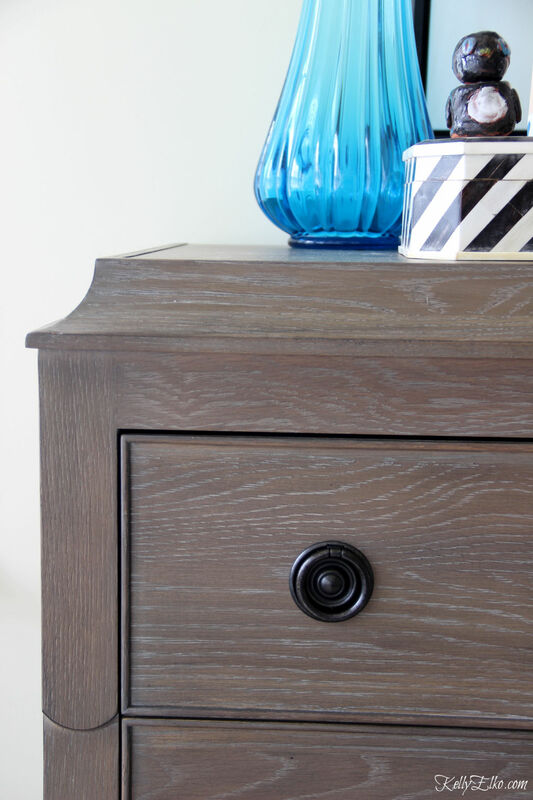 I am in love with this cerused oak Auberge Dresser – the grain of the wood is beautiful. My girls silhouettes and a few of my favorite things are on display. 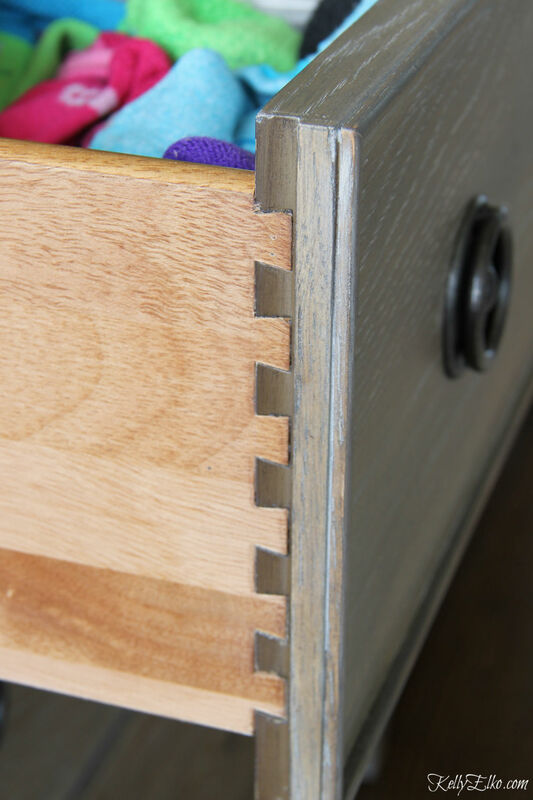 It’s all about little details including mortise and tenon joints. A matching Myra Accent Chest is on my side of the bed. I love the more masculine feel and straight lines of the chest that I dolled up with a few favorite accessories. 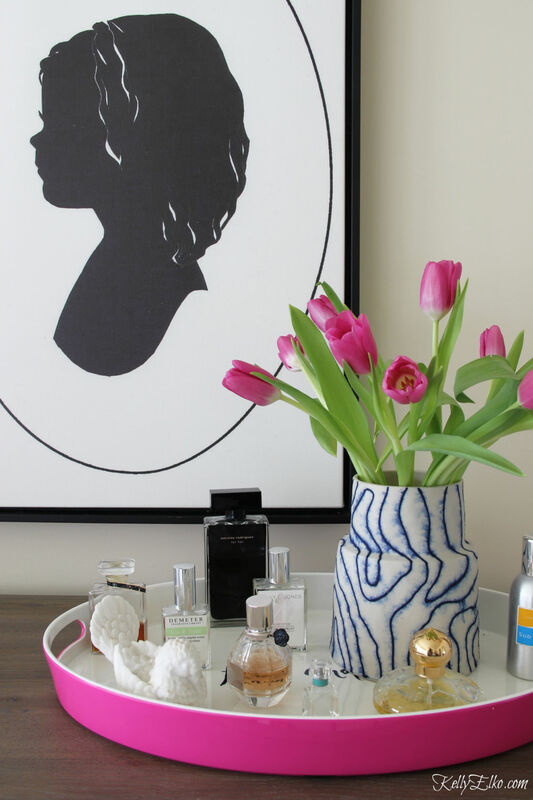 Every nightstand needs an amazing smelling candle and this little teacup is the perfect place to hold my jewelry. Ruffles, fringe, velvet and tassels add tons of texture and interest to the bed. The best part of the room is my comfy new mattress (my back has never been happier)! 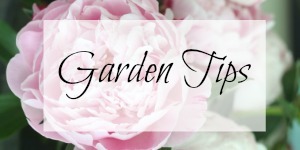 There is nothing I love more than making a room beautiful but beauty doesn’t mean much if the room isn’t comfortable and that starts with a good mattress. 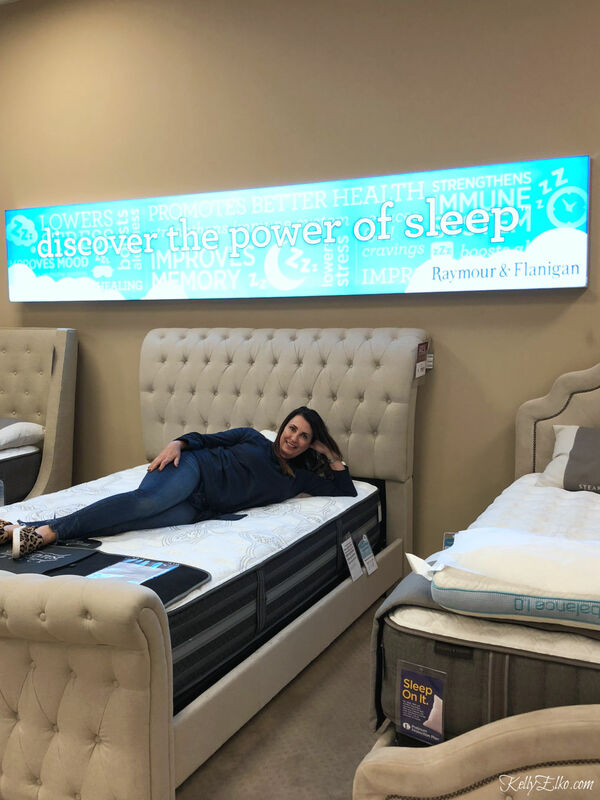 My hubby and I had fun trying out a bunch at our local Raymour and Flanigan and ended up choosing this Beautyrest Black mattress and box spring with the help of the very knowledgeable manager who made the process painless. Delivery was super quick – the very next day – and I love that we have 30 days to decide if it’s right for us (it is)! They set it up in my bedroom and even hauled away our old mattress. Sushi really enjoys spending quality time here now that the room meets her high standards! I love that adding a few key pieces and colorful accessories to my bedroom gave it a whole new look and feel and I couldn’t be happier with the result. 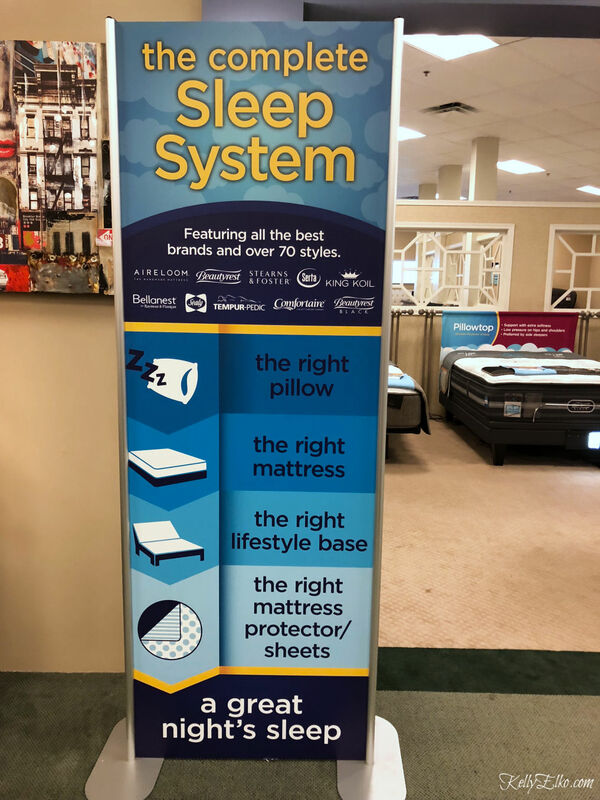 I was impressed with the helpful sales people (they even sent me a thank you card) and selection both in store and online at Raymour & Flanigan so if you’re on the hunt for quality furniture or accessories or need a new mattress, I encourage you to check them out. Looks beautiful! We have the same bed- Restoration Hardware. 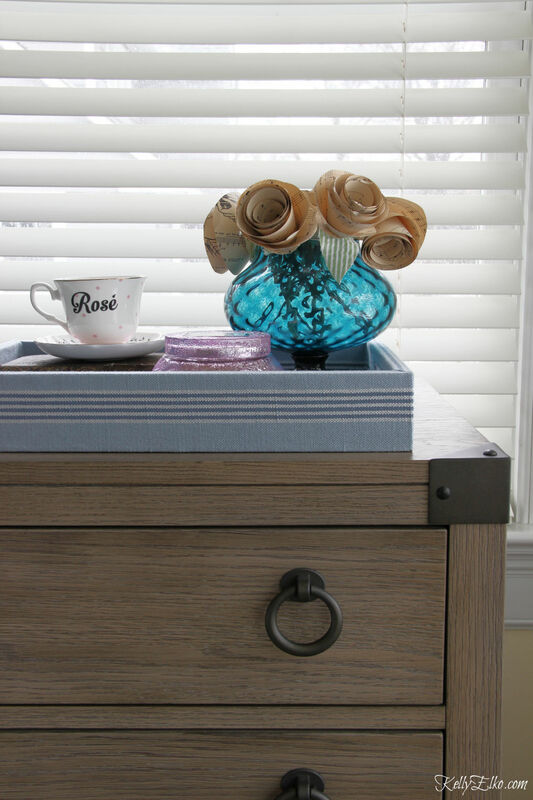 Love your home tours. Thanks for sharing. 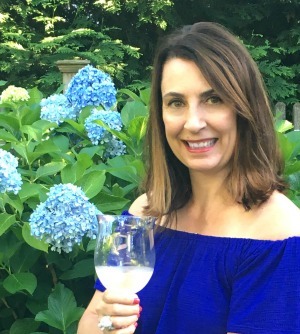 Thanks Jo Anne – my bed twin! 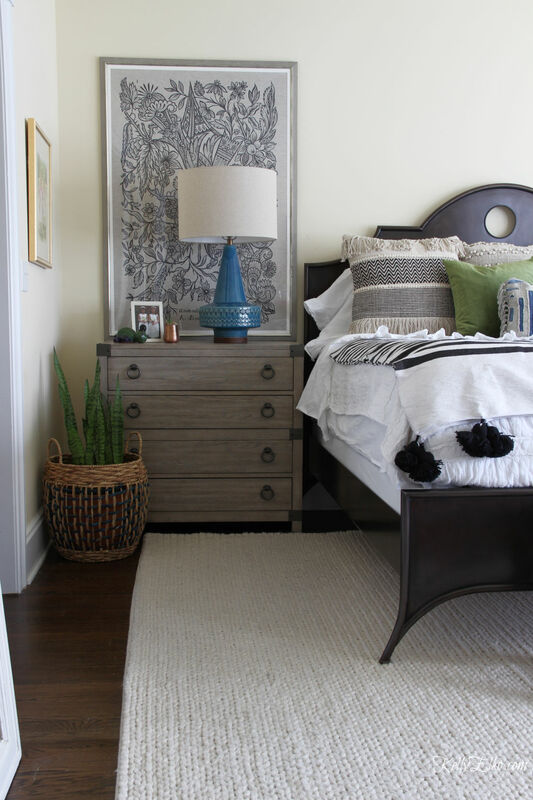 Love everything about your bedroom makeover – looks fabulous! Thanks – come on over for a snuggle any time! it looks beautiful, kelly! i love the changes you’ve made and love the black and white! Thanks Cassie! I am trying to make my decor match my dog! You did Bliss-full and he I am! Did you get the adjustable base? No but maybe I should have. It would be fun to raise my hubby’s head up while he sleeps! Fat fingers on phone without glasses =typos. You figure it out! 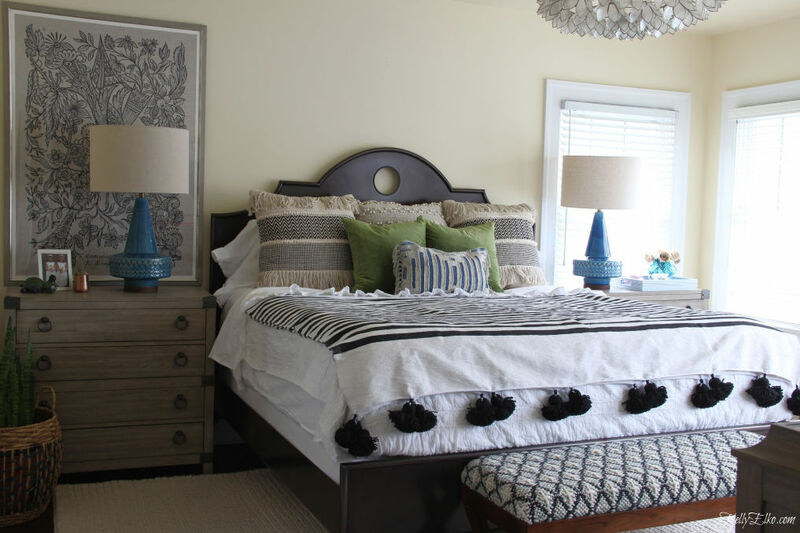 Your bedroom looks amazing…. a fresh new look for another 23 wonderful years. LOL Diane! And congrats on 35 years for you and your hubby! I love all the pieces you added to create such a cozy bedroom. Wondering if you could provide the source for there rug? You have a beautiful new bedroom so you should feel like a very important person, Sushi does. Where did you get that little bird on your dresser, looks like something special, it is so cute. How Sushi feels is really all that matters in life! 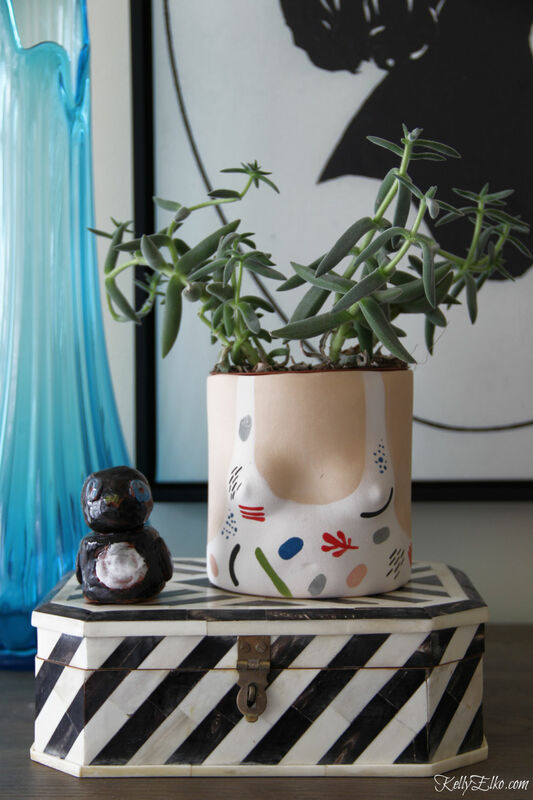 The little alabaster dove is a vintage thrift store find. Love what you have done. Cute pic of you! I have the same house plant that you have on your dresser! Lovely! Very relaxing and comfy looking. Love, love your lamps, where did you purchase them? Thank you Tammara! 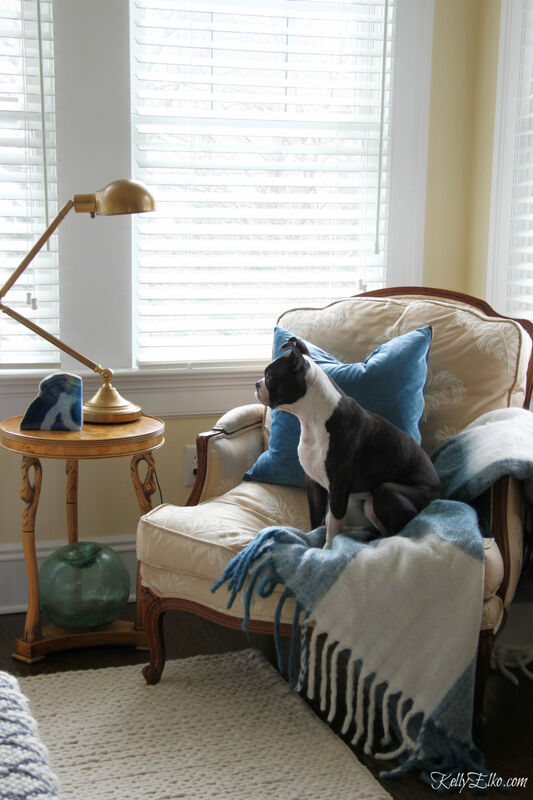 I got the lamps a couple of years ago at West Elm but they are no longer for sale. Your room looks so beautiful Kelly!! And the lamps are to die for. Congratulations on23 Years! I love your new bedroom. Goals! Thanks so much Jeanne – I really love how it turned out!